Sometimes one has to venture out of one’s comfort zone to experience new things and get surprised in the process. This was the case for me when I recently joined a group of foodies on a day-long food tour of Pampanga, organized by Spanky Enriquez. 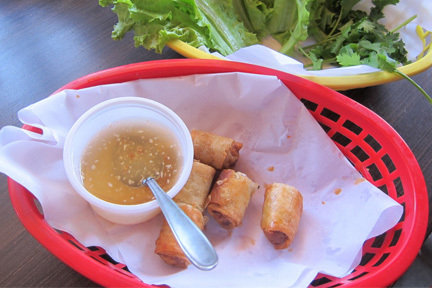 One of my favorite stops was at an unassuming and simple take out place called Banh Mi Saigon. Owned by Rex Soriano who has a five-year work stint at Nobu New York under his belt. I would assume that Chef Rex was inspired by similar Banh Mi stands around New York City. These joints are reputed to have stellar versions that can rival even the best that Vietnam can offer. 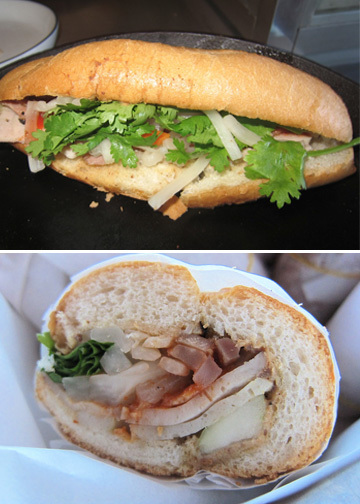 Banh Mi Saigon serves a Roast Pork (P70), Roast Chicken (P70) and a Cold Cuts Combo Banh Mi (Dac Biet) (P75). I tried all of them and I thoroughly enjoyed myself. This was amazingly good value for money given the fact that there was no scrimping on the filling. My favorite was the Combo: Slices of steamed pork (Cha Lua), liver pate, crunchy pork ears, carrot and daikon pickles, fish sauce, cilantro and peppers. A lightly toasted baguette served as an apt, edible carrier. Initially, I thought that the Combo would come out to be to busy, given all the ingredients. But I was wrong. Everything worked synergistically. I would have had another one except that I was pacing myself since we still had a long day of eating ahead. This is HIGHLY RECOMMENDED! 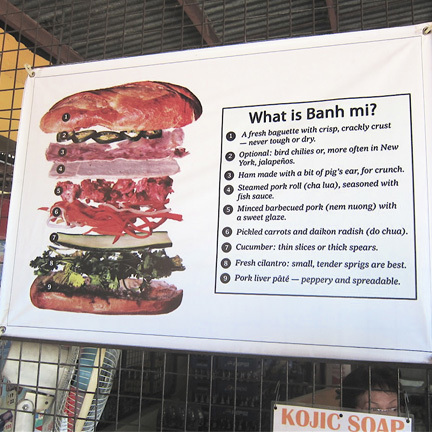 Banh Mi Saigon also serves Goi Con (P70) or fresh Spring Roll and Cha Gio (P70), which is the fried version. The Cha Gio was my favorite. Crunchy, tasty and not too oily, this was another winner. Plus, the sweet sauce and the fresh lettuce wraps were good accompaniments. I would also recommend using Sriracha sauce as an alternative dipping sauce for those who prefer a spicy kick instead. There is a part of me that wants Chef Rex to have a presence in Manila, however a bigger part of me just wants him to stay put in Angeles City, making subsequent visits, though not as frequent, still special.